This is the topic of a recent coaching call I had with a client. 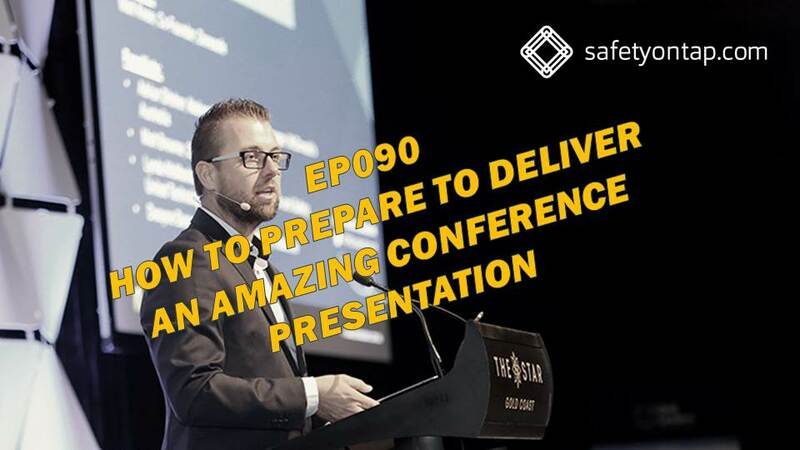 Check this out if you want to learn how to prepare to deliver an amazing conference presentation or any presentation to a large group. Hey, guys, it’s Andrew here from safetyontap.com. I find myself driving to the airport at the moment. The reason why I’m driving, why I’m traveling is because I’m going to help a client with some workshops that I’m facilitating at the moment and I find myself facilitating and spending time in structured group activities and speaking at conferences, in particular, a fair bit at the moment and there’s a number of conferences coming up that I’m speaking at as well as emceeing and I thought it was really timely to make a video for you because I had a coaching call with someone this morning and the challenge that they had was really timely in relation to that conference prepare for an amazing conference presentation that they were delivering so I thought I’d make a little video I’m not sure how long it’ll be….along my journey to the airport which kind of describes the journey that we could take as we go from idea about a conference presentation to the actual delivery of an amazing conference presentation. Now, this hopefully will be helpful for anyone who wants to speak at a conference obviously but anyone who needs to get up in front of a group, a large-ish group, so not kind of a meeting larger than a meeting and have an opportunity to prepare what they going to talk about then this will be helpful for you. Stay tuned! Okay, so first things first. The question that I ask at the beginning of any of these discussions or that I ask myself when I think about spending time with a group is “what is the difference that I’m trying to make in the lives of the people who will be hearing my message, who’ll be spending time with me in the conference presentation or workshop or whatever?”. Now that’s two really important components: 1. Who is it that I’m spending time with? We need to make sure that we understand who they are, what their interests are, what their backgrounds are, why they’re going to be in that room in the first place, and what difference are we trying to make? And DIFFERENCE is the important thing because we’re not just trying to make an impact when we speak when we communicate.We’re not just trying to make people feel good. A difference is something more substantial. A difference is helping people move from where they are now to where they could be a better kind of place. So that’s the first and most important question is what difference are we trying to make to the people who we’re going to be spending time with? Sometimes what happens when we get asked to speak or where we have an opportunity to speak to a group of people it either goes like this: “Here’s your topic, can you talk about this” or “I want you to talk about this”. We get given something we can give in a constraint or an objective or the difference that someone else wants us to try and make with a group of people were talking to and that can be tricky but that’s that’s okay if we start with something. Or the other,which i think is probably more common, is they say “Here is 40 minutes” or “here is an hour” or “here is 15 minutes, off you go,use it how you wish” and so whilst that might not be a helpful way to start and that most important question around “what difference are we trying to make to the people who are spending time with?” that’s always the first question. But we need to next to work with what constraints we’ve got sometimes the constraint is what we’ve been asked to do and always the constraint is how much time have we got. So, in the coaching call this morning, after we’d worked out what the difference this person was trying to make to the audience in the room that they’re going to be spending time with, we then worked out the time constraint. 40-minute presentation. In 40 minutes my general rule of thumb, the way that I would approach it with live presentations, is that you can deliver – really well – three main points. Three main pieces of content or ideas or concepts in 40 minutes so if you break that down that’s five minutes for a bit of an introduction or five minutes if you assume that they’re potentially not going to be on time which is reasonable for you to do. Five minutes intro, ten minutes first point, ten minutes second point, ten minutes third point, and then you’ve got five minutes to wrap up. You can adjust the timing if you like but the key takeaway here is in about 40 minutes you’ve only got three key points. Now whatever time you’ve got if it’s 90 minutes or two hours or a day or whatever it’s important for you to work on how can you chunk up the time that you’ve got into meaningful, manageable, digestible chunks. That’s really really important to make sure you get clear on. Okay, so we’re in long-term car park, now long-term’s always a better option even for a short trip because it’s always cheaper and it forces you to go for a walk. I should say…in the background… let’s do this… can we see… there should be back there there’s a Toll freight plane. I’ll put a photo in the video of a much larger plane, in fact the largest plane in the world, which was parked here just last week at Adelaide Airport which might be interesting…. my kids were pretty impressed with the size of it. It came to Adelaide and it had a bunch of army tanks in it! In any case, what are we up to? We’ve got our three key points on our presentation so we know what we’re going to talk about. We’ve got containers, if you like, of how we’re going to fill it in. So when we think about the structure of each of our key points the first thing that we’ve got to start with, I should say that I start with, and that we talked about in this coaching call, is story. So story is something that just brings us to life! It brings conversations to life, it brings our memory and so many different parts of our brain to life when we’re hearing stories or when we’re telling stories it’s kind of a process that engages both the teller and the hearers of the story. So we need to start with our key points and then have a think about the stories that we can use or that are relevant to those couple of key points. Now this is often where we get a little bit confused with the traditional ways of doing presentations. In this coaching call, this person defaulted to the…Oh, there’s a crossing here so I’ll back in a sec Okay we’re back safely across the other side of the road. And so story. Story is really important so this is where we’ve got a little bit confused because case study was the word that came up. “Case study” we’re gonna tell a case study. Now that’s excellent because I think lived experience is very very important for us telling stories I think it’s a great way for you to start thinking about what stories can be told.I think it’s a great way to use social proof in terms of influence: actually saying that this is a reality. This is not an idea. This is not theory. This has actually happened, which is really really helpful. But case studies can be just so boring and if we use the term case study and if we deliver it like a case study then it kind of sounds like the way that we’ve always done it before. So take the case study idea if you want to do a case study by all means and tell a story! When I say tell a story it’s literally the case of me going, or someone else going “Right, so I was standing up the front and I just froze because this girl Haley had just asked me probably one of the most tough and awkward conversations in a workshop that wasn’t already going particularly well”. That’s the kind of way that we need to tell stories. Now the the thing that people often challenge me on is that “Yeah yeah, but that takes a lot of time and it means that I’m not gonna be able to actually get to my point”. I guarantee you that your point will be made far better if you actually – and it should be stickier, it will be stickier for people who listen to it – if you take in say 10 minutes, 8 minutes to tell a story and two minutes to wrap it up to make your point so every single one of our points in our conference presentation needs to have a story to begin with. Now stories are great but they’ve got to have a point because the stories that our grandparents tell and that other old people (I’m not being ageist here) the stories that people tell who spend far too much time in pubs… some of those stories are great but if they don’t have a point then it’s not going to actually help us make a difference with someone. Might make them feel good while they hear the story or have a laugh or whatever but we want to go a little bit further than that. So when we think about our story we’ve got to have a think about what’s the moral of the story what’s the point how does it fit in with the key message or the key chunk if you like of information we’re trying to deliver in our presentation. So start with the story then we think about what’s the point or the moral of the story and then once we’ve got those two things then my recommendation is that you start to have a think about visuals. So you can tell a story using visuals really really effectively and by that I mean use lots and lots of slides lots and lots of pictures to bring it to life. This is maybe where some of your case study information comes through if it’s people you’re talking about put pictures of real people (ask permission obviously). You don’t need lots of words for this because people will be hooked on the story that you’re actually telling. Now at this point in time, talking about the presentation in the coaching call, this person said: “Oh you know I just need to make sure that we keep the slide deck really lean you know not many slides at all”. Now my view on that is that is that works really really well if you’re going to do a presentation that is really wordy, that really details heavy, then you’ll want to keep it light. If you’re going to be telling stories and you’re not going to be using words then you want to use bucket loads of visuals. Bucket loads of photographs and images that actually help to tell your story and I said in fact that in a 40 minute presentation it’s not out of the question for you to have 40 slides so you to be moving at more than one slide per minute in order for you to be augmenting the story that you’re telling with the visuals and so by engaging people in telling a story and using visuals you’re actually using the two forms of communicating that are far stickier to any human being, believe me, irrespective of their learning style compared to using text and talking in facts and numbers and things like that. So only now that we’ve got our stories based around the our key couple of points we’re making our presentation and we’ve got some visuals to help us tell that story can we actually start to think about the facts that’s the information that we’re going to pull together in order to put the meat on the bones, if you like. But the narratives, the story that you tell, is actually the main structure of your talk that I find works really really well and then we sprinkle facts and information in and around it. Like I said in a 10-minute slot, in a 10 minutes point, if you spent eight minutes telling a story in two minutes with the rest of the facts and details then I think you’re going to do really really well. So finally we want to make sure that we finish off on the most important bit which is making the difference for people. So we might have engaged them in their presentation we might have had some good stories we might have had some good visuals but we need to make sure that we finish on them having a takeaway: having something practical, something to take action on that isn’t just feeling good. So in this particular coaching call, we agreed that that was going to be, on the basis of this person’s experience, a series of ‘do’s and do not’ in regards to some of the broader kind of activities that they were suggesting people take. ‘Do’s and do not’ is a great way to do it.’How to’s’ is fantastic. ‘My time again’ kind of takeaways would be excellent. ‘Getting started’ points are fantastic too – in any case, whatever way you structure it you need to have a think about how you’re going to finish on each of your key points with what the takeaway is. What the action is, something that’s clear and simple and easy enough for people to take action on right now. At the front end and the back end of the presentation, we’ve got kind of an introduction in the conclusion. In the introduction we talked about, serves the purpose of just making sure that people in the audience think that you’re worth listening to. So a little bit of background about you; no one really cares about your qualifications mostly, but they might be interested about your story and how you came to be there what you’re big WHY is. And then at the back end of your presentation your conclusion might be you, in various different ways, wrapping up a couple of points that you’ve made a bit of a summary if you like, like I just did of the key structure, the key points, the key takeaways, whatever it might be. And that’s the whole presentation. So the next bit is about how do you actually get into that preparation to make sure that that on paper turns into something that’s amazing in reality. Now you’ll notice that I didn’t really talk very much about how that structure, if you like, actually turns into the words that come out of your mouth. And that’s particularly important because I find that the planning and the thought and the effort, the time, that goes into your or structure, if you lik,e what I just outlined, will get you 90% of the way there and then the last 10% really depends on each individual person so what I’m going to tell you is different for the person who I was coaching today and will potentially be different to you. One of the common questions that I get is do you just do a structure and then do you just wing it from there, just fill in the gaps basically? Or alternatively (and these are not the only two options but the two common options) do I script out a talk, if you like so that it’s word-for-word. Which then leads to natural questions about how you actually deliver it. So I’ll give you my view and then what we talked about in the coaching today. My view is that I change what I do all the time. I actually did a presentation, a conference presentation not long ago where I had the physical script, in a room where I never stand behind a podium, in my hand keep me to time because it was a 20 minute presentation and I wanted to see if I could if I could stick to that and it fell totally flat on its face. So that really didn’t work for me the whole scripting process but scripting in general I find actually helps us get really clear in our thoughts even if we don’t use the word for word script when we finally deliver our presentation. So that’s where it actually serves you in your preparation rather than the delivery of the final presentation. That’s one thing to bear in mind. In the coaching call today the most important question – for me to ask as a coach when the person I was coaching asked me about that question of should they script or should they not, is what’s worked well for them in the past before? If they haven’t done conference presentations before like this or speaking like this, then it doesn’t really matter where you start you just need to get started then give it a go. In your practice, you might actually find that you’ll figure out what’s going to work for you or in particular what’s not going to work for you. For this person, they had done presentations before where they do the 90% structure and then just deliver and they’ve come unstuck on that before. Never ever scripted before. So my suggestion was to try the scripting process. That also enables them to do more practice and that’s another thing that they hadn’t done a whole lot of before with these types of presentations. So getting your script really clear means that you choose your words really really carefully, unlike this video that I’m doing which is unscripted which is probably a little bit more waffling than it needs to be!. So scripting your presentation helps you prepare. Whether you use the script at the end of the day it doesn’t really matter. So that’s one of the key questions I get around scripting your presentation or kind of using this structure to go free flow. And then, a couple of other questions that we had around preparation, is how much should you practice? My view is is that if you’re going to spend time with a room of people whether that be ten people or twenty people 100 people or 200 or 500 people, which is kind of getting towards the conference presentation end of the spectrum with those larger numbers, there’s a lot of time, there’s a lot of attention and arguably a lot of money that’s sitting in the room in the sense of people who have taken the time to stop and listen to you. So my view is you, taking the time to prepare for respecting those other people’s time, is really really important so I do I try to do lots of preparation for my talks obviously the more talks you do if you do regular kind of talks or use the same sorts of concepts then that requires less preparation because mastery starts to come into play but preparation nonetheless is really really important so that’s always my suggestion is to do a dry run. This person today came up with their own idea – solving their own problem – of actually recording their presentation on skype. I think it was, and then sending that round to other people for feedback they can also do that as a review and the term that we used was ‘post-match review’, kind of like happens in a football match where you’re able to watch back and see things and hear things that you wouldn’t have realized were coming out of your mouth always you but you were behaving when you’re actually delivering your practice presentation. And finally, there are some of the logistics aspects, you know, this person in the coaching said that one of their biggest concerns was about making sure that they were ready even if something went wrong. So they had an experience where the notes that they had prepared weren’t available they were on an iPad I think, and the iPad went missing and the presentation was really not particularly good not because they couldn’t deliver the presentation but because they got psyched out because they felt like that was the crutch, that’s what they needed in order to deliver a fantastic presentation. So there’s a couple of things that help you if you prepare, if you practice, then your structure will help you. The visuals will actually help your brain hook into the information that you talk about on each of your visuals, so that helps if you’re using a presentation, and also if in the event that you go and do your talk without your notes well whatever those notes are the script or just brief notes then the the amount of practice that you’ve had will mean you’ve got a bit of memory have you had it like like it’s it’s pretty straightforward if you’ve practiced it then you’re going to be more likely to be able to deliver it without the need for your notes. Your notes are always going to help and sometimes there is a bit of a safety net but in any case, all that preparation helps you manage that kind of risk. In terms of anchoring on to your presentation, your slides, I thought I find it’s always helpful to make sure you’ve got slides on a USB, slides on a computer, slides in the cloud, that sort of thing, so you’ve got a bit of backup there and that’s pretty much all of the logistics that I really focus on. So now we’ve kind of got the bare bones of our conference presentation we’ve got what did what’s the difference we’re trying to make to the people who were trying to help, who it who were trying to hang out with; we’ve got our constraints around time in this instance it was it was only time focused as opposed to topic focused, and so we know what we’re working with here. We know how many key chunks we can break up that time into, (nice announcement there) our key time chunks we’ve got: 40-minute presentation, in this case, was three key points of about 10 minutes each. So three key points work out what those three key points are going to be – the most important things that are going to make a difference to your audience! If you only had three things that they were going to walk away with you might be lucky that one of them actually sticks. Three key points for your structure within your structure of each of your points, what you want to be thinking about first of all is what story can I tell that gets us to an endpoint that gets us to a moral of the story or a takeaway if you like. Around your narrative you want to work out what visual story you can tell if you’ve got slides if you don’t have slides then that’s fine, that’s one last step for you to think about. Using lots of visuals is okay. Very very few words on those, if at all. But you can use words in those presentations where you are using visuals just to kind of delineate that the couple of key points that you’re trying to make. Andrew, a vlog about delivering safety presentations recorded while behind the wheel i.e. distracted driving is a little ironic and dilutes the importance of the message. If you are driving, you should focus 100% on the road ahead, not producing a video.